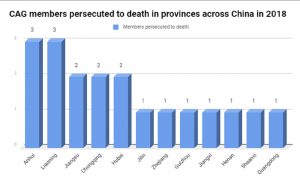 As the year-end statistics are tallied, the extent of persecution in China becomes clear. Thousands arrested, many tortured, 19 dead, all from one church. Bitter Winter has reported repeatedly on mass-arrest operations against The Church of Almighty God (CAG) . Recently compiled year-end statistics show just how much the persecution against CAG members has increased in 2018. According to the latest numbers provided by the Church, throughout 2018, at least 10,938 CAG members have been arrested by the authorities across 30 of the province -level administrative divisions in mainland China (there are a total of 34 of such divisions); and 6,653 were put under detention, with 2,350 remaining in custody today. Five hundred twenty-five were subjected to torture or forced indoctrination, and 354 had been sentenced to prison time, with sentences as long as 13 years. In addition, at least 31,947,245 RMB ( about $4,736,500) in church and personal assets have been plundered by the CCP. Numbers of the CAG members arrested in 2018 (provided by The Church of Almighty God). The Church of Almighty God is a new Christian religious movement established in 1991. Since 1995, the Church has been put on the list of xie jiao (the CCP banns some religious groups for unclear – and what appear to be arbitrary – reasons). According to Article 300 of the Criminal Law of the People’s Republic of China, participating in a xie jiao constitutes criminal activity, and warrants a prison sentence of three to seven years or more. As a member of The Church of Almighty God, one may be arrested , detained, and given a heavy prison sentence just for possessing religious books of the Church. 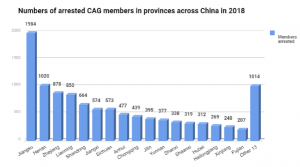 According to the figures in the chart above, Jiangsu Province arrested the most CAG members at 1,984, followed by 1,020 arrested in Henan, 878 in Zhejiang, 850 in Liaoning, 664 in Shandong, 574 in Jiangxi, 573 in Sichuan, 477 in Anhui, and 439 in Chongqing. The Church of Almighty God reports that there are pregnant women among those arrested. Some were subjected to torture and abuse by the police while being held in detention and consequently suffered a miscarriage. Arrest and maltreatment by police often lead to the death of those in custody. In 2018, there were 19 well-documented cases of members of The Church of Almighty God dying as a result of persecution. Circumstances of those fatalities include sudden deaths during illegal interrogations, deaths of individuals who were persecuted in prison and died shortly after their releases on bail, and individuals who were sent to hospitals from detention centers with severe injuries, and died from those injuries in the hospital. Seven of the 19 died under abnormal circumstances within a month after they were put under detention. Critics say these deaths amount to extra-judicial executions of Christians in China. Numbers of the CAG members persecuted to death in 2018 (provided by The Church of Almighty God). The case of Liu Xin (pseudonym) from the municipality of Chongqing in southwestern China is typical of the deaths of CAG members in police custody. Bitter Winter previously reported that she was arrested by the CCP police in April 2018, and was secretly interrogated and tortured for 25 days . On May 21, already close to death, she was sent to the hospital where a doctor diagnosed that her skull had been shattered. Several months later, she died despite efforts to save her. It appears that the persecution against the Church of Almighty God is not random or sporadic, but carefully planned and ordered from the top. According to multiple classified CCP documents published on Bitter Winter, in 2018, CCP launched a planned, comprehensive suppression operation against the CAG across China. 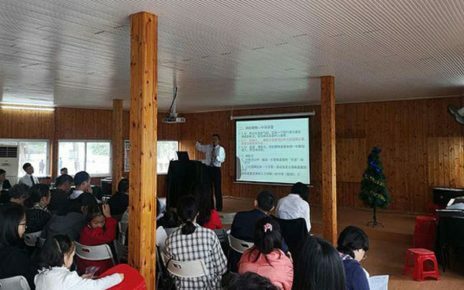 For example, the authorities of a city in Shanxi Province issued a document requiring a year-long special campaign to crack down on The Church of Almighty God to investigate local communities and neighboring villages for any activities of the Church there. The authorities of Henan Province issued a secret document in May, requiring a 1-year-long special suppression campaign against The Church of Almighty God and placing emphasis on ensuring the achievement of the goal of “destroying its domestic foundation and crippling its influence abroad.” From June 11 to October 1, Jiangxi Province launched a special campaign to suppress the CAG , during which at least 200 believers were arrested. Even before the mass arrest operations, the CAG was under intense surveillance. According to sources, authorities used either “Skynet” (the largest surveillance camera network established by the CCP) or long-term tracking and stakeout surveillance to monitor Christians and acquire information about them. After that, arrests followed when authorities had the opportunity. Reportedly, police officers even dressed up as plumbers or pretended to be couriers to get into homes to carry out investigations . 2018 was a dark year for the Church of Almighty God. It was also a strong example of the damage that can be done when a state launches a comprehensive and determined campaign to attack a religious organization.